Hello. Here we are. Two humans and one dog. We are about to embark upon a most interesting journey. Without boring myself or anyone else, the story is that this day has been anticipated for some years. In 2010 it was a dream. A year later, we bought this white Eurovan pop top camper. The day after we brought the van home, we left on our first over night slumber party. We had so much fun, the following summer was filled with numerous more vacations. 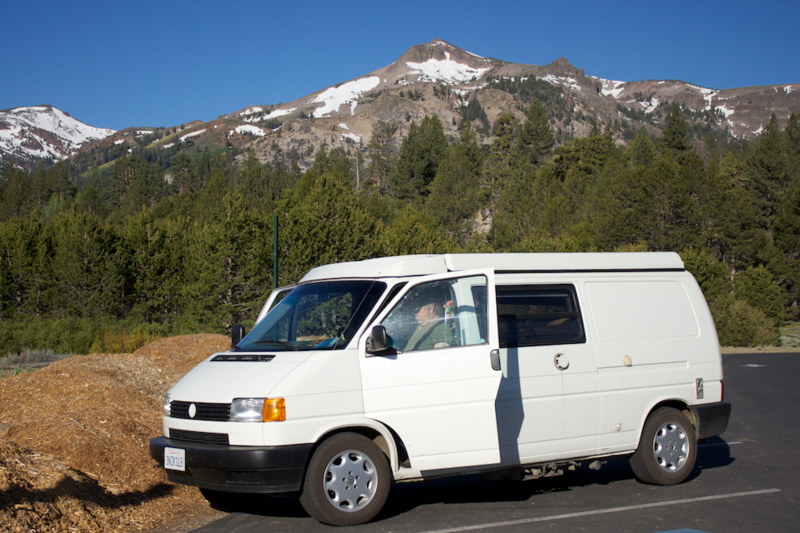 In the years that followed, we’ve continued to vacation, primp, and care for our van while staying strong when tackling repairs or purchasing expensive parts and gear. Yep, we adore van life. Fast forward, and now here we are, in early 2014, preparing to go long term (as in having no other place of dwelling) in this little white van. For the past few months, we’ve busily de-cluttered, tossed, donated, and burdened our children with more boxes of “stuff” than they really need. The hidden crevices of stash swallowing closets, attics, sheds, and garages are for the most part empty. Much of the furniture is gone, thanks to Craig’s List, our same beguiled children, and the local thrift stores. Our few irreplaceable’s and heirlooms will live in an all American storage shed for the time being. As seems fitting at this time in life, while our path meanders off in new directions, this blog as well, is starting it’s own uncharted journey. It’s documentation is partly for our friends and relatives, some cheering us on, and others panting with unduly aghast at adventures or misadventures. Mostly though it is for us, as a place to record our excursions…hopefully post some lust worthy photos, maybe add in a few philosophical thoughts, and who knows what type of common (or uncommon) sense we acquire along the way. If you’ve stumbled along here, as happens in internet land, pour yourself a cup of tea and enjoy the journey. She looks a little bit like Edna our van from your photo. I’m envious, all the best. Hopefully we’ll be able to make an epic voyage one day. Until then it’s snatched holidays and weekends. Welcome to Keevan Soul! Snatched holidays and weekends are lovely. That’s what we have been doing for the past three years.I’m looking forward to following along on your adventures in the UK. So much we can all learn from each other.